Eastern Europe is known for producing some excellent, relatively underground folk bands, such as Ukraine's DRUDKH, and FORODWAITH of Belarus are no exception. They wield complex Melodic Death Metal weaponry with a slash of Folk, heavily lyrically influenced by Tolkien lore and Norse mythology, and musically, by ELUVEITIE, CHILDREN OF BODOM and AMON AMARTH. 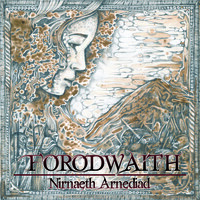 Let me begin by claiming that their latest album, “Nirnaeth Arnediad” is a true musical epic; the album feels like a titanic, mythic concept album, intended or not. The intro track is deliberately long – 3 minutes - sounding like the beginning of a Tolkien movie and leads straight into the longest track, “Nirnaeth Arnediad”. The band could not have picked a better opener, with marksmanship riffage bombardment, and deliciously catchy melodies provided by the guitars and exotic Folkish instruments. “Stone Guardian” is a relatively straightforward, but downright-headbanger of a track that opens much like a killer AMON AMARTH track, and yet contains strong throwbacks to ALESTORM. Driving, heavy, bearded Viking-ness. The next track is a peculiar one and completely departs from the Tolkien direction of the album; “Death and Beer” is about exactly that, and sounds like the kind of Death Metal one would find in a Gondorian pub, yet contains my favourite solo on the album. “Horn of Gondor” is definitely one of the stronger tracks on the album, that takes classic aspects of aforementioned Metal stalwarts and combine it into a song that is highly diverse in melody, riffage and mood. By the time of listening to “The White Tower”, I am starting to feel some unfortunate predictability about the album, in that I am musically unable to differentiate it from the previous tracks. So far, nothing has lived up to their killer opener; my favourite track on the album. Luckily, “Saga” breathes new life into the record, with dynamic, syncopated riffage and majestic dual guitar-folk melodies. “Morgoth” is an intriguing follow up, with a much stronger bass presence, and contains some of my favourite riffage on the album; it is clear that FORODWAITH have near-mastered the art of mixing, the state of which is excellent for an unsigned band. Mick once again proves his virtue as an exceptional lead guitarist. “Revenge of Mjolnir” is a gorgeously composed track, showing incredibly strong ELUVEITIE influences, and the catchiest melodies on the record; the various Folkish instruments, which I dare not try to name, are most prominent on this track, and most definitely add to an air of authenticity. Ultimately, after nine solid tracks of metallic fantasy, the closing track “Valhalla Feast” could not have ended the album better. The slowest song on the album, it is by far one of the most interesting, and the atmospheric keyboard work adds something unique; the way this song is composed, I feel, is the greatest story-teller on the album; Norse heroes recalled from death to Valhalla to endlessly feast and fight. Given that being carried to Valhalla on the back of a Valkyrie's steed was only the beginning of a second life for a Norse warrior, I truly felt it poetically apt to end such an epic recording with this piece. After listening to FORODWAITH I am strongly inclined to further explore music hailing from Eastern Europe; from what I've seen, the potential is endless. Especially if I can expect more Metal written about Vikings, Tolkien and beer.